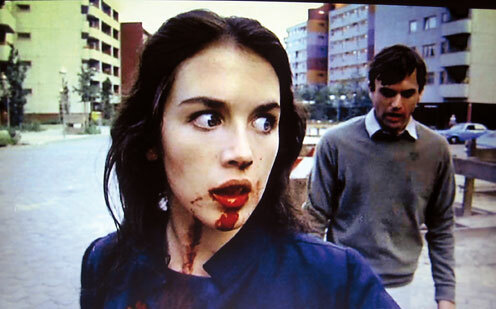 With its arthouse stylings, BAFTA and Palme d‘Or nominations, as well as a thoughtful, but bizarre, delivery Andrzej Zulawski’s 1981 Possession was an unfortunate film to end up on the video nasties list. Much maligned, it was banned in the UK and, when released in the US, faced more than 30 minutes of cuts. The film has more in common with Lars Von Trier’s Antichrist, rather than The Omen, but the movie was re-edited to ramp up its horror themes losing much of the its power and sense. The story follows the break-up of a young couple, played by Sam Neill and Isabelle Adjani, the love affair she embarks on, and then the tentacled monster she creates and is willing to kill for. For more information on the film listen to the Video Nasties Podcast, here. Now the movie has been lovingly restored onto Blu Ray. A HD presentation which shows a film that is staggeringly detailed and beautiful. Filmed in West Germany the detailed of the early 80s decaying landscape is striking. The movie, which frequently closes into brutal close-ups of its pained protagonists is crystal clear considering its age. The disc features “The Other Side of the Wall” documentary and an interview with director Andrzej Zulawski which were both on the previously released DVD. But there is more on offer here, a brief, but insightful, featurettte of Basha, who created the movie’s notorious poster. An interview with producer Christian Ferry, an interview with composer Andrej Korzynski and audio commentaries from Zulawski and co-writer Frederic Tuten. Zulawski’s insight is the most interesting, he originally created the movie after a messy divorce and his explanation for his choices, and how he made the film offer more insight than you would imagine considering the movie is over 30 years old. Disappointingly the promised feature on the movie’s UK and US reception and nasties scare is really just comparison scenes from the UK and US cuts of the movie. That said there’s plenty here for fans of the film to get your teeth into and, for a film that revels in the ugliness of obsession, it’s beautiful to look at. Categories: News | Tags: Possession, review | Permalink.